Yesterday bright and early, I got up, fixed my cup of coffee, ate a doughnut hole, entered my destination into the navigation app on my Droid, got in my truck and headed to Hayden Alabama to attend the 10th annual Bloom-N-Pie Days at the home of Harold and DeLois Dunn. Last year I took the Mini Cooper and was severely limited in the number of plants I could bring home, so this year I had the foresight to go in my truck. I planned to be there as soon as they opened so I would have first shot at purchasing some fantastic daylilies and hydrangeas which the Dunn's have in abundance. It would also give me a chance to catch up with Mrs. Dunn and her son Clay with whom I had become friends last summer. I was so pleased that they remembered me and commented that they hoped I was coming this year. Mrs. Dunn showed me some of her new raised beds that she was very excited about and how much easier they were to tend compared to the regular beds. She also stated that she should have had the event last week as a lot of the daylilies had already bloomed out. Everything has bloomed earlier this year. All the same, there were tons of daylilies in full bloom to dazzle the eye. 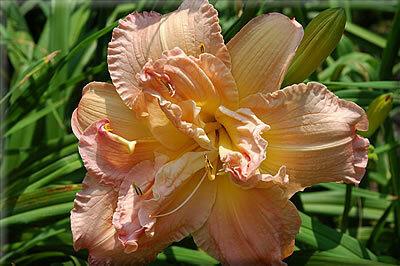 DeLois and one of her prized daylilies. 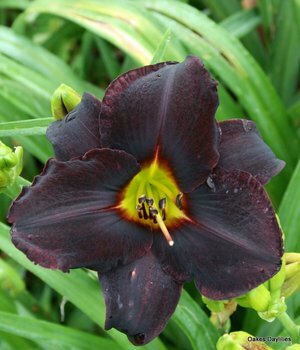 As usual the selection of daylilies was mind boggling, and I was like a kid in a candy store, I could have bought a truck load, but Cynthia warned me not to go "crazy" and I have learned to heed her advice. I did come home with five new daylilies that really caught my eye. Alabama Jubilee, Carribbean Frank League, Spanish Fandango, Mauna Loa, and Pink Peppermint. I could have bought more and I will before the summer is over as I routinely see Mrs. Dunn and Clay at the Farmer's Market in Trussville. 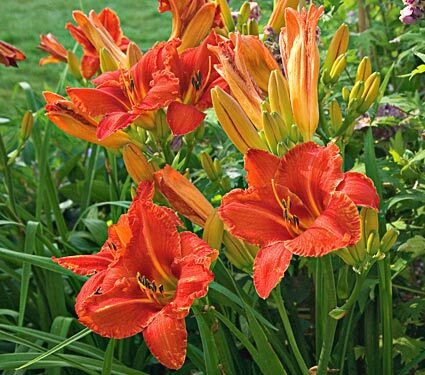 I have tons of room for daylilies at the new house, but I have to remember to put the "horse before the cart" and put some thought and effort into the beds before buying the plants, which I am far too often guilty of doing. In addition to the great daylilies I purchased, I also came home with a "Blushing Bride ", and two "All Summer Beauty" hydrangea and a special surprise, a "Golden Raintree". Utility wagons are provided to load up your plants. Rows and rows of daylilies. Potted daylilies in foreground. Needless to say I could not leave without purchasing some of the Dunn's famous fried pies to take home. I took home an assortment of apple, peach, chocolate, pecan, and coconut creme. DeLois and husband Harold have sold their fried pies at the pie cottage at Homestead Hollow in Springville for over 20 years and hundreds each year at the Bloom-N-Pie Days and also at the Blount County Covered Bridge Festival in October. It was great seeing DeLois and Clay again and I am very excited about my new purchases and how I plan to use them in my garden. 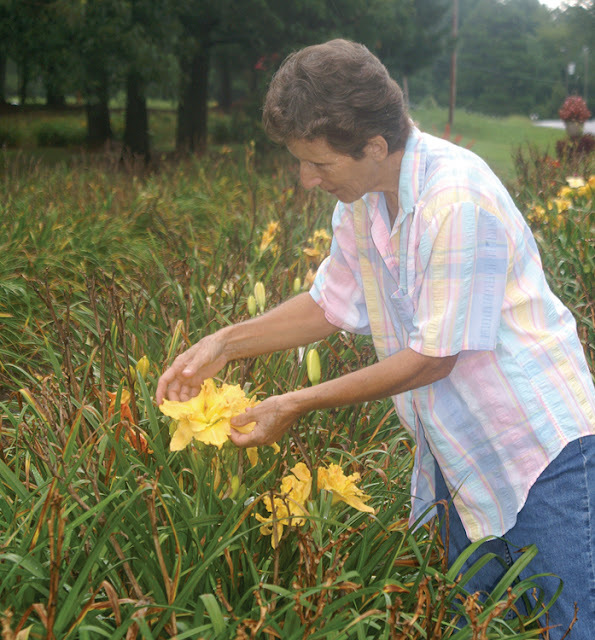 I look forward to visiting with them at the local Farmer's market in the coming weeks and adding to my growing daylily collection. 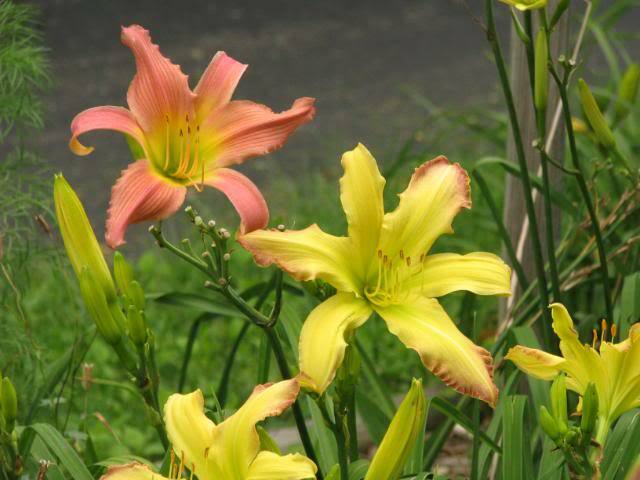 Dunn's Daylily garden is open daily from June 11th through June 30th. Please call ahead.